OK, so if you read my last best-of NYC post, you'll have sourced sufficient caffeine to get you through the morning, which makes it hamburger o'clock. It was New York that got this recovered vegetarian back into burgers, way back in the early noughties. Before then, I tended to associate them with what you usually got in English restaurants at the time: an over-cooked, bland-tasting patty that has almost nothing in common with the juicy, meaty, cheese-and-bacon-garnished beauties that adorn the tabletops of Manhattan. Fortunately, it's a little easier to find a good burger in London too, these days, but that doesn't stop me looking forward to a visit to these addresses. As before, if there are multiple branches, I've listed my favourite. Corner Bistro (West Village). As long as you like at least one of the following three, you won't regret a trip to Corner Bistro: burgers, beer and sports. As it happens, I don't drink beer or watch much sport, but the burgers are good enough that I don't mind the long week-night queues for a table in this dark, cosy and gloriously unpretentious West Village haunt. I usually order the bistro burger, with cheese and crispy bacon. Bliss. 331 West 4th Street @ Jane. Mini-review. Website. P.J. Clarke's (Midtown). P.J. Clarke's is a family favourite. I can't remember our first visit, but their spectacular — and reasonably priced — cheeseburgers have kept me coming back on almost every New York trip. The restaurant has an old-fashioned vibe and the bar — always packed with the Mad Men and their descendants — has a great juke box. 915 3rd Avenue @ 55th St. Mini-reviews here and here. Website. Twitter. A P.J. Clarke's montage. Two of these photos were taken way back in 2007. The Spotted Pig (West Village). The Spotted Pig had been on my to-do list long before I eventually made it to the English-influenced West Village gastropub. It was almost 35°C that day, but I still couldn't turn down the burger, which was perfectly juicy and came with shoestring fries. 314 West 11th Street @ Greenwich St. Mini-reviews here and here. Website. Twitter. Shake Shack (Flatiron). There is a reason why I was so excited when Shake Shack opened a branch in Covent Garden: their burgers are awesome and well worth the queues. The Shack Burger (a cheeseburger with special Shack sauce) is my favourite order. The only trouble is that after I've polished off one of those, I rarely have room to try one of their famous shakes and custards. #MiddleClassProblems. Madison Square Park, near 26th St. Mini-review. Website. Twitter. 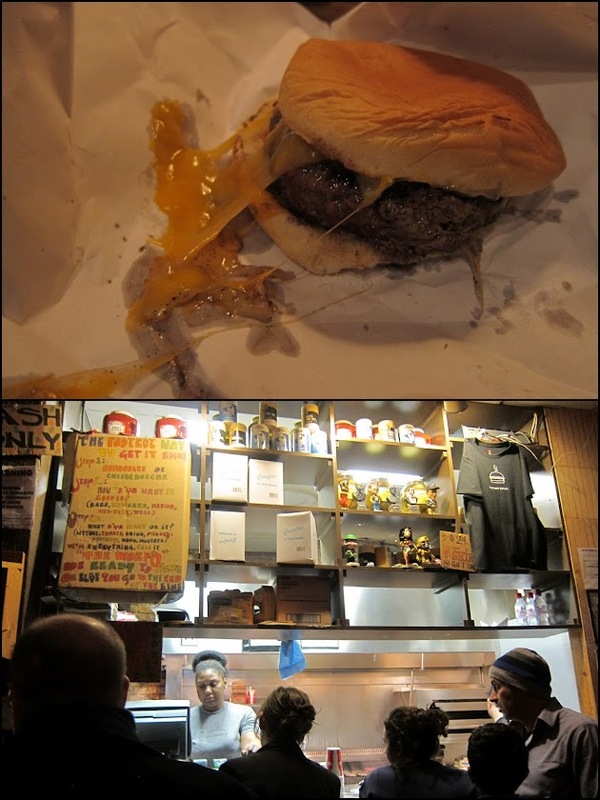 Burger Joint (Midtown). There's nothing quite like the feeling of pushing back a velvet curtain in the lobby of a swanky Midtown hotel to reveal a secret burger bar. Still, even without the experience, the burgers are very tasty and this is a great, reasonably priced place to refuel in Midtown. 119 West 56th Street bet. 6th & 7th Ave. Mini-review. Website. Twitter. Smith & Mills (TriBeCa). At the point on my holiday at which I arrived at Smith & Mills, I'd already had far too many burgers, but how could I resist when they were offering a burger with white cheddar, and chips (i.e. crisps) on the side? Smith & Mills is also a lovely, intimate restaurant, which I wish was my local. They do fab cocktails and it's a low-key but very New Yorky place to hang out. 71 North Moore Street nr Greenwich St. Mini-review. Website. Five Leaves (Greenpoint). Sitting outside at one of the pavement tables at Five Leaves, and whether it's a crisp autumnal lunchtime or a hot summer evening, you'll have a very Brooklyn experience. But although I came for the people-watching, I came back for the burger. 18 Bedford Avenue @ Lorimer St. Mini-reviews here and here. Website. Back Forty West (NoLIta). This was another victory for the 'good typography = good restaurant' index. The menu is divided into modes of eating ("hands," for instance, or "fork and knife") and I'm happy to report that the hand-held burger, oozing with cheddar, did not disappoint. 70 Prince Street @ Crosby St. Website. Twitter. Minetta Tavern (Greenwich Village). I'd been waiting so long to visit Minetta Tavern that I didn't even mind that when we rocked up at eight-thirty or so, we had to wait until ten for our table (it's not such a hardship when the cocktails at the bar are so good). The Minetta Burger, with its cheddar and caramelised onions, is said to be one of the best in the city and I agree heartily, but if you're not in the mood, you can choose from a range of other New Yorky takes on French food. 113 MacDougal Street @ Minetta St. Website. Saxon & Parole (NoHo). Another design-based restaurant choice that worked out well. The burger comes with cheese, maple bacon and shoestring fries and as my last supper on my visit to New York in June last year, it was infinitely better than any plane-food meal. The burger also comes with a fried egg, but I asked to have mine on the side. The bar at Saxon & Parole is seriously impressive, and I was pretty impressed with the puddings too. 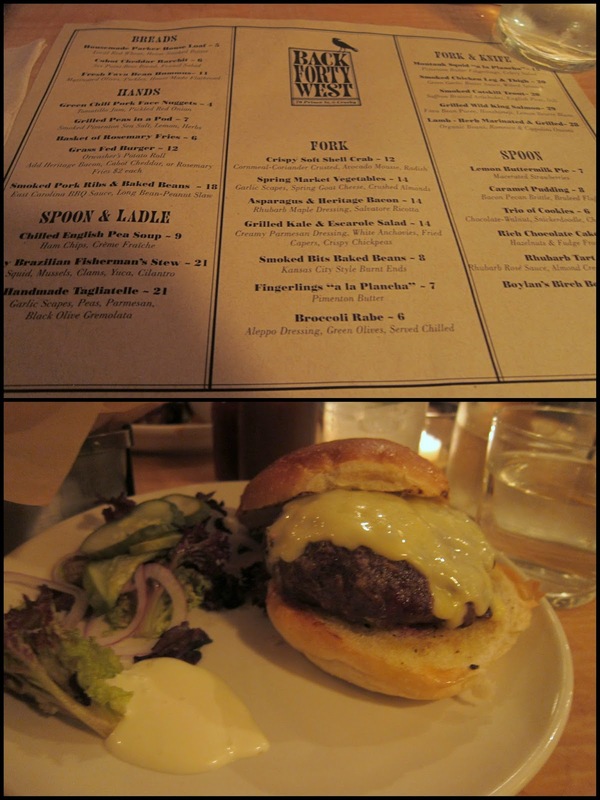 316 Bowery @ Bleecker St. Mini-review. Website. Twitter. Have you heard about Mother Burger? It's in Times Square. I haven't been there yet, but I have picked up a book by Monica DiNatale which she writes about best places to eat in NYC on a budget and that place was in there. The Shake Shack looks fantastic as well so great burgers are abundant in NY it seems. DiNatale's book is great though for travelers to the city, 365 Guide New YOrk sity, 365guidenyc.com.